If you wanted to learn about young people, you would probably visit a school where there are lots of young people, right? This photograph shows a star "school" - home to over a thousand of the biggest and brightest young stars in the sky. 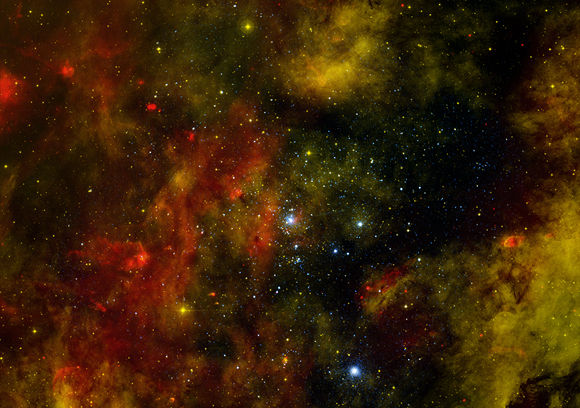 When astronomers want to study young stars, this cluster - called Cygnus OB2 - is one of the first places they look. One of the most interesting - but unfortunate! 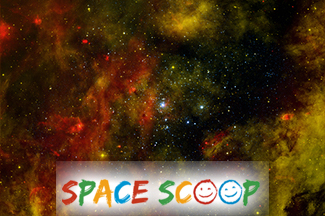 - discoveries that astronomers made while studying the massive, young stars in this cluster, is that most of them will host fewer planets than their brothers and sisters in less massive clusters. Some might not host planets at all! When a star forms, there is always some material left over. This becomes a disc of dust and dirt, like a thicker version of Saturn's rings. Within this disc, small dust grains made of rock and ice can form, and these sometimes merge together into larger and larger objects - imagine rolling a snowball around in the snow: it becomes bigger and bigger as it collects snow. This is how planets are born. Massive, young stars however, can destroy the dusty discs of their lower-mass neighbors with their intense energy spatting out, long before any planets might be born! Cool fact: One of the brightest stars in our whole Galaxy lives in this cluster. It's nearly two million times brighter than the sun!